In 1826, a Catholic Convent, school and chapel were constructed on Ploughed Hill in Charlestown (now part of Somerville). Boston was deeply Protestant, dating back to the original Puritan theocracy, and intolerance of Catholics was increasing due to religious incompatibility with Catholic doctrine, and competition for a limited number of jobs. By the early 1830s, friction between Catholics and Protestants had reached a crisis point. 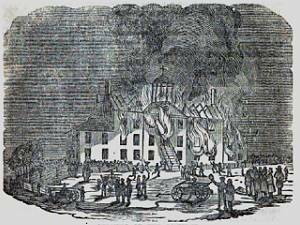 "The destruction of the Ursuline Convent in Charlestown on August 11, 1834, was the cause of more excitement throughout the United States than any other event up to that time. There were various causes that led indirectly to its destruction, among the most prominent were rumors of the confinement of nuns against their will, added to which was the escape of Miss Harrison, who confirmed the reports which had been put in circulation by those who desired its destruction [she returned to the convent after one day]. On Saturday evening, August 9th, the Selectmen made a visit to the nunnery and left perfectly satisfied in their own minds in regards to the erroneousness of the reports that were in circulation about nuns being confined against their will, but it was too late to notify the public of the results of their visit before Monday. About 11 o’clock on Monday night, a bonfire was made by burning tar barrels on the highest point of the hill near the convent. Soon after a party of some fifty persons disguised as monks, with painted faces, assembled in front of the building, and after informing the nuns of their intention, they gave a short time for them to pack their things and leave the building. When the time given had expired, they began their assault upon the convent. Some of the nuns were placed in carriages and taken where they wished to go. The assailants in the meantime had broken in the doors and windows, smashed up the furniture, and piled it up in the different rooms in the building. At about half past twelve, the main building was set on fire in the second story, and in a few hours it was completely destroyed. The chapel, the bishop’s lodge, and the old nunnery, a large wooden building situated a short distance from the convent, were also set on fire, and burned to the ground. The work of destruction continued until daylight, when the mob dispersed, and all that remained of the famous Ursuline Convent was the blackened walls and smoldering ruins." Several men were charged with arson and burglary, but were all acquitted. Mary Ann Moffat, or Sister Mary Edmond St. George within the church, wrote a book in defense of the Convent that quickly sold many copies. Anti-Catholic sentiment still abounded, and threats were made against her life. She was soon transferred to a convent in Quebec in an apparent attempt to relieve tensions in Boston. No one was ever held accountable for this terrorist act of 1834.